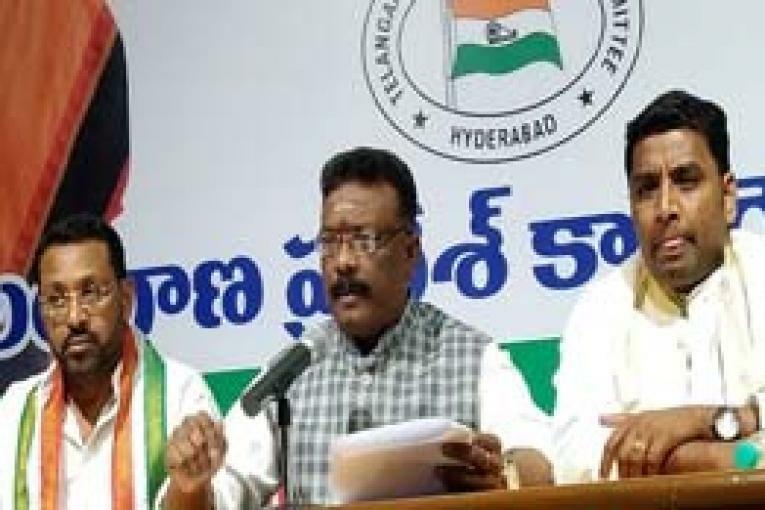 Hyderabad, Jan 22 (Maxim News): All India Congress Committee (AICC) Spokesperson Dr. Sravan Dasoju has strongly condemned Chief Minister K. Chandrashekhar Rao for not appointing minimum number of ministers in his cabinet and described it as a violation of Constitution of India. Addressing a press conference at Gandhi Bhavan on Tuesday, Sravan released a copy of open letter which he wrote to Governor E.S.L. Narasimhan seeking his immediate intervention on absence of a full-fledge Council of Ministers even after five weeks of formation of new government. “The Article 164 (1A) says that the total number of Ministers, including the Chief Minister, in the Council of Ministers in a State shall not exceed fifteen per cent of the total number of members of the Legislative Assembly of that State, provided that the number of Ministers, including the Chief Minister in a State shall not be less than twelve. However, violating the constitutional mandate, the present government as of now consists of only the Chief Minister and Home Minister,” he said. Further, he said that the Article 163 (1) of Constitution says, “There shall be a Council of Ministers with the Chief Minister as the head to aid and advise the Governor in the exercise of his functions, except in so far as he is by or under this Constitution required to exercise his functions or any of them in his discretion”. Hence, in the absence of a full-fledged council of ministers, even the role of Governor has become deceased and defunct in Telangana, as there is none to aid and advice the Governor. Sravan said except for four portfolios of Home, Stamps and Registrations, Relief and Rehabilitation, Urban Land Ceiling, all other portfolios are kept with a single person, i.e., the Chief Minister. He wondered whether Mahmood Ali enjoys the authority to take independent decision on portfolios being held by him. “There are 33 departments and 289 organizations in the government of Telangana and it is humanely to impossible for one person to make decisions and monitor their execution. Without minimum number of ministers, we are not only curtailing the functioning of the government, but also doing disservice to the people who participated in democratic elections and voted. How much time it will take to reorganize the departments? It is a lame excuses covering up the delay in forming the full-fledged cabinet. How come such a small cabinet takes any decision?” he asked. “We wonder what for we have had these elections and why it is being allowed to blatantly violate the constitution and scuttle the spirit of democracy? To form the full-fledged cabinet is not only a constitutional mandate, but also a tradition and custom to be adhered to by any ruling government,” he said. Sravan alleged that Telangana State was now under zero-governance due to lack of cabinet ministers. “We hear that there is a serious financial bankruptcy in the state of Telangana, there is a delay in payment of pensions, and many electoral promises made by ruling party are yet to be grounded. In the absence of the Finance Minister, who is gathering information to prepare the budget? There are already signs of drought in the state and what kind of proactive disaster management is being taken up. Whole lot of planning is needed to ensure adequate supply of seeds and fertilizers to farmers in forthcoming Kharif season. In order to facilitate sufficient lending, the government is expected to arrange for state level bankers meeting. As such Rythu Bandhu payments are not completely made, many farmers received only messages on the polling day but not the money. Thousands of crores of bill are pending for ongoing projects. On the whole, there is no transparency and utter chaos in Government,” he said. Stating that there were more than 30 lakh unemployed youth in Telangana, the AICC Spokesperson said that there was no mention of unemployment issue in the Governor’s speech. Similarly there was no clarity on 3-acre land to Dalits or double bed room scheme etc., “There are many issues and many loose knots that need to be knitted by the ruling government and to do that we need a full-fledged cabinet so that it collectively shares the authority and accountability. Or else it is not democracy but a mere autocracy, which is detrimental to the spirit of our constitution,” he said. Sravan said that Governor was a custodian of the Constitution and is responsible to rigorously persuade to implement the same. “The Council of Ministers is collectively responsible and accountable to the legislative assembly and government does not mean one or two individuals. It is unfortunate that without full-fledged cabinet, the assembly sessions are allowed to be held and the honorable Governor delivered lecture, giving direction to the government, which does not have complete cabinet,” he said. “Ironically, he said, a dictatorial ordinance was brought in with regard to Panchayat Raj Act and the same was assented the ordinance by the Governor without looking into whether there was minimum quorum of cabinet ministers to recommend such ordinance. On the whole there is a serious crisis to democracy and the spirit of constitution is being destroyed in Telangana,” he said while appealing the Governor to ensure that provisions of article 163 and 164 of our constitution are implemented to protect the interests of people and democracy at large. He urged the Governor to intervene to ensure expansion of cabinet on a war footing. Sravan also congratulated the Congress workers and leaders for putting up a brave and decent performance in Panchayat Raj elections. He said despite defeat of several senior leaders in recently held elections, party activists did not let their morale go down. They bravely countered the threats and intimidation by TRS MLAs at local level and ensured Congress victory in over 900 Gram Panchayats as against 2600 won by TRS in the first phase. He said that the Congress party could have won more seats if ruling party would not have misused official machinery and police to win polls. He appealed the Congress workers to exhibit the same spirit in the second and third phase of Panchayat Raj elections. Alleging that EVM hacking was a reality, Sravan demanded that the Election Commission of India introduce ballot paper in the forthcoming Lok Sabha elections. He said cyber expert Syed Shuja’s has made several shocking revelations in the London conference on how EVMs were hacked and how the murders of BJP leader Gopinath Munde and writer Gowri Lankesh were linked to EVM hacking. He said that EVM tampering was the only reason why ECI did not accept the Congress party’s demand to count the VVPATs slips in recently held Assembly elections in Telangana.